Good and convenient marine GPS navigation system will help us to sail safely. waves on seven seas. In many cases, we have extensive knowledge of the navigable water area, but in spite of then dense fog or even heavy snow and can catch us, and we will lose orientation. Today, an invaluable assistant for shipping is the Marine GPS navigation systems. There is a large range of different systems from many manufacturers as Raymarine, Garmin, Furuno, Hummingbird and much more. It has gained much popularity in many mobile phones GPS navigation application. The majority of smartphones have built-in GPS receivers, and they can be used as a navigation tool. However, although the significant number of GPS Navigation Apps offered for cell phones, they never outweighed the special Marine GPS hardware. I can assure one hundred per cent from personal experience. A couple of years ago, I sailed on PRINCESS 42 motor yacht from Latvia to the United Kingdom. It was a very exciting and eventful voyage. Maybe somehow in another post, I will tell you about that unforgettable voyage. I was already on the way home took the fuel in Den Helder in Holland. Leaving from the port, I found that the ship’s GPS Raymarine chartploter had gone out of order. I did not have time to start looking for the reasons of failure due to the relatively bad weather and needed to keep a sharp lookout to navigation. For me as a backup device had a laptop with electronic charts C-MAX software. Excellent soft, convenient for navigation and I continued to sail towards Kiel Canal. 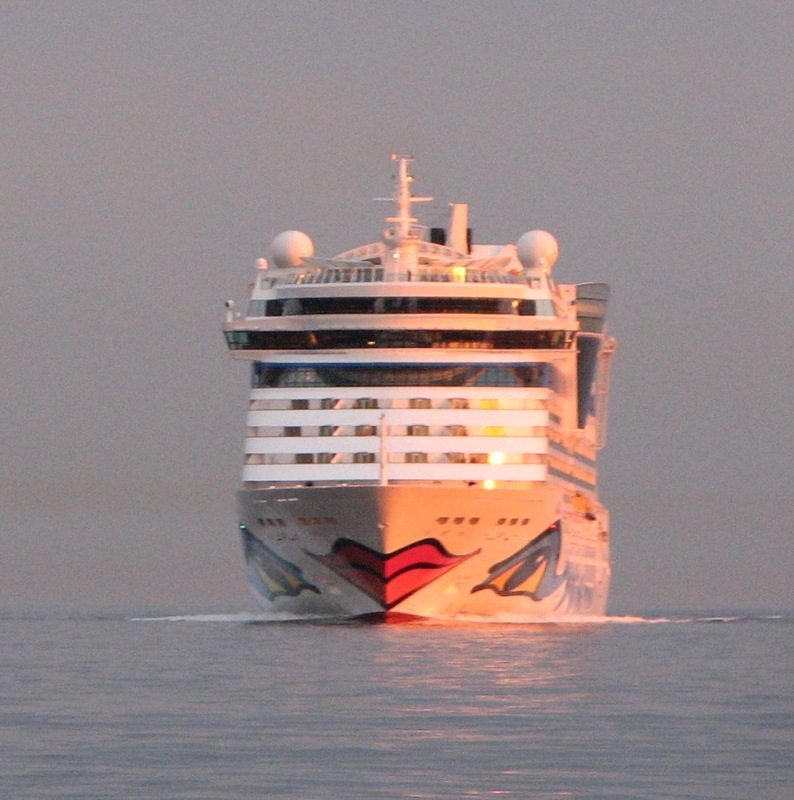 After passing Kiel Canal already in the Baltic Sea, next troubles took place. Laptop charger has gone nowhere. Well, and hear me came to the aid of the iPhone 5 with the NAVIONICS Boat GPS Navigation app. It is one of the most widely used and very popular boating application. Those charts are almost real, detailed Admiralty maps. Navigate any seagoing craft are decent enough if only you know how to handle a smart phone. You can reach valid results and use it for navigation. At this time the iPhone saved me a lot of my nerve cells. Yes, maps, navigation signs and lights and other information are rather detailed, but as a full-fledged navigation instrument, iPhone or other Android smartphone cannot be used. I say this as a professional sailor. 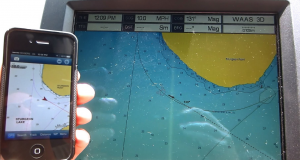 GPS marine navigation apps can be used as an auxiliary tool but in no case should not rely solely on smartphone use. Mainly it takes place if sailing the open seas. The smartphone is not the best portable GPS navigation system but could save some nerve cells in the emergency situation. I approached Stralsund straits where navigation is allowed only through the narrow navigation channels. There was a dark, some channel buoys with light some without. The small screen of the iPhone to see all details were very difficult for safe navigation. It was good that there was not a big distance to reach wider waters. Two words about the inoperative RAYMARINE which is not a cheap GPS navigation system. I had used the mobile Internet connection and logged on one of the sea forums also found a solution how to decode RAYMARINE software. 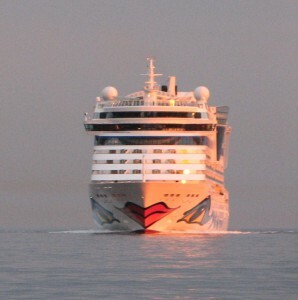 Remaining three days to the home port was without surprises. Follow my site, and I will try to share experiences and learn more by myself to safer navigate in seas and quicker reach our destinations. I’ll give you short reviews of some boat GPS navigation system devices mainly have been used by my fellow mariners or me. I really liked your article on navigation aids. I worked the past 18 months for Jeppesen Sanderson which supplies marine navigation data to systems like the ones you described in your article. Your story of the problems you encountered and how you worked around them is very interesting and entertaining. After the troubles you encountered would you still recommend the Raymarine GPS as a good system to buy? Hi Rick! First of all many thanks that have read post. First of all apologies if there are any grammatical errors. English is not my mother tongue. I am really appreciate that you are interested in the topic of what I write. If briefly, then definitely RAYMARINE GPS is a great choice. This system lockups could quite easily be removed if knows how to do it. I have had problems with other brands of GPS machines, but almost always they have been software errors. They are usually voidable. This was very interesting to read. Thank you for educating me about Marine GPS Navigation. I didn’t realize all this was part of the GPS systems so I was really happy to know a lot about boats and navigation systems. Even though by the sound of the article, English is not your first language but I thought you wrote it very well. It’s clear to understand and thanks to you I now more about boat apps! Good job. Thank you for comment Jelly! And for my English, I will try more to improve my writings. Do not want to give someone write on my site, it will no longer be my job. About GPS navigation I have a lot to say. If in such speeds will develop this system, the GPS will soon be able to install in needle. ya the navigation system is a very important for safe sailing. my uncle has two nag systems on his boat one for normal use and one for backup. he spends big bucks on the latest systems for his boat. but with something a nav system i think is a good idea to invest some money its only gonna make you experience safer. Hi Casey! Your uncle is wise man. I, as an experienced sailor can say, that never ever joke with sea or even small lake. Always keep spare safety equipment and no words, that GPS navigation on board nowadays is one of our lifeguard.